The Government Nursing Officers’ Association has decided to call off the island-wide nurses’ strike from 7.00am tomorrow (May 6), after considering the hardships faced by patients at hospitals owing to the trade union action. 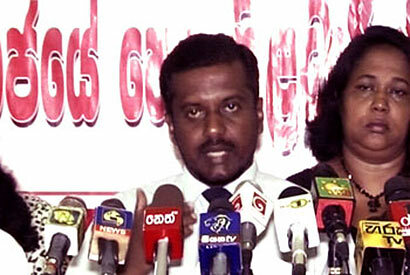 President of the Government Nursing Officers’ Association (GNOA) Saman Ratnapriya, addressing press conference in Colombo today, stated that they have decided to call off the strike and give the government one week’s time to resolve the midwifery training issue. Nurses at government hospitals across the island launched the strike on May 3 after talks between Health Ministry officials and the trade union to find a solution to the dispute ended in failure as both parties were unable to reach an agreement. The Government Medical Officers’ Association (GMOA) and Government Midwifery Service Association had opposed a decision to provide midwifery training to nurses, resulting in the strike action. These nurses have just minimum O/L and A/L qualifications but demand the facilities of doctors. Doctors are the cream of intelligent people in the country getting highest marks from A/L from all districts of the country. These gyes always speak about rights but not duties and responsibilities. Average nurse withdraws a high salary compared with other government officials with higher qualifications. Now government should train army, navy , and airforce soldiers as nurses (as we have no war now) and use them in emergencies like this. Then these nurses strikes will be unsuccessful.